CardMonkey's Paper Jungle: Triple Time Stamping ... and a Winner! Cherie, please be in touch with me at your earliest convenience, to provide me with your mailing address. I can be reached privately through my e-mail at cardmonkey@comcast.net. The technique I'm trying here has been called "Triple Time Stamping." Basically, what you do is cut three layers on a card, temporarily adhere them together, stamp randomly. 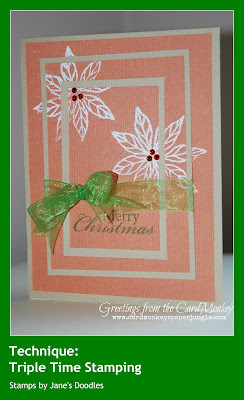 Then, disassemble your cuts, mount them on a background solid, embellish and affix to your card. Congrats to the winner. This is a neat technique. I am not typically a stamper, but I want to try! 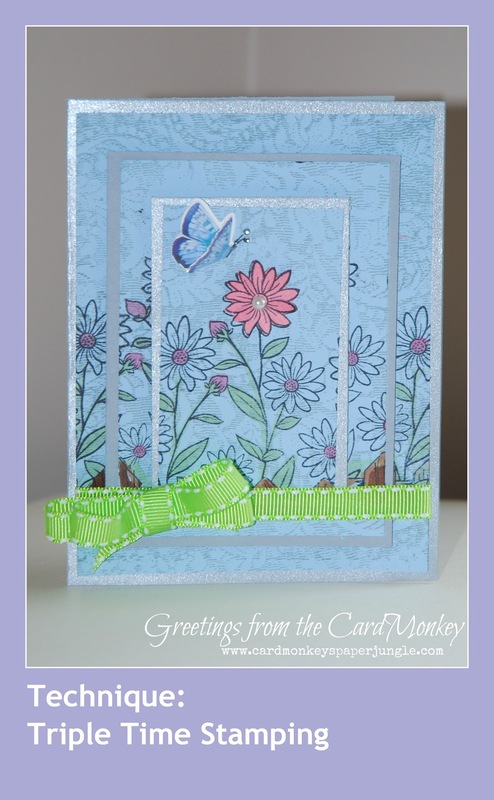 This is really neat and your cards are beautiful! TFS.--Pat N.
Congrats to Cherie! !hope to try this technique this wknd..it's been a fun wk. seeing whateverone has been doing with this...TFS!!! Thanks so much. It was a fun hop. BTW: This is a great technique. I'm pinning it for future reference.